We have previously talked about how much does a video production cost. The proper answer to this question is fairly long, but in this post we want to talk only about the main components that drive video production costs up or down. 1.Concept, Script and Storyboard Development. First we would like to talk about concept, script and storyboard development. It is possible to create a simple web video with your own concept and script, but mid-range productions and higher will need professional copywriters and storyboard artists to work on your project. This is a separate cost you have to bear in mind. Secondly we would like to point out that there are video production teams with various levels of expertise out there. If you are ready to trust you idea to a recent film school graduate, you can reduce your costs considerably, but if you prefer professionals with years of experience, that will also mean that the cost will be different. 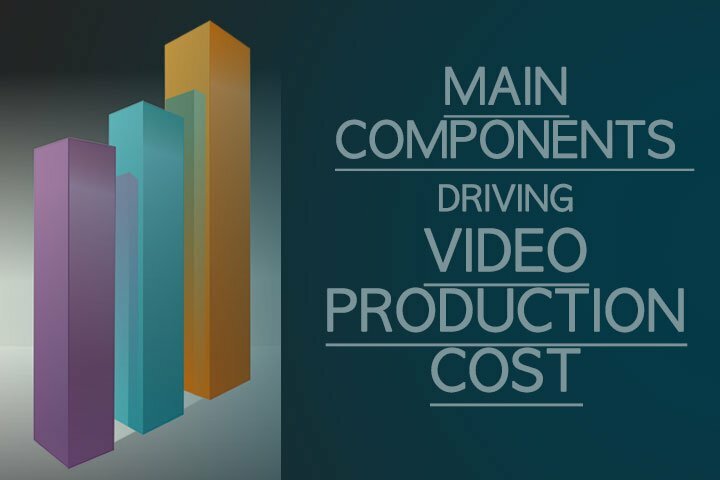 Third component driving the video production cost is the shoot length. We could actually choose the shoot length as the last aspect to talk about, because you can only determine the shoot length after all else has been planned. Anyhow – the more complex the video, the more days of shooting it will require and the cost will obviously be higher or lower respectively. Fourth component is the number of locations you want to shoot in. If for example you want to shoot a CEO interview conducted in his office, it will be significantly less costly compared to a TV advert shot in several locations across UK or even worldwide.Plus you have to consider that some locations like studios or special interiors will have to be hired. There also might me some location permit costs associated with certain locations. 5. Travel, Accommodation and Catering. Variety of locations also obviously involve travel and accommodation. Travelling to locations, staying away from base location for more than one day – all this will incur travel and accommodation costs. And those costs are significant. Also – the longer the shooting the more likely it will involve catering costs as well. Component number six is the level and the amount of equipment you will need to use and the crew size. Shooting with DSLR and shooting with cinema camera usually will have different price tags. Getting those special shots with crane or steadicam will again mean extra cost for equipment and crew. Larger projects will need admin team. And again – the more complex the video, the more equipment and crew will have to be hired. 7. Actors, Presenters, Talent and Voice Over. It is possible to produce a decent video without actors, presenters or other talent, but the moment you decide to hire one, you have to realise that it will increase the cost of the video a lot. Especially if you want to hire very experienced professional or even a celebrity. 8. Special Effects and/or Animation. All special effects – be they make-up driven body effects or computer generated visual effects – require work of specialised professionals and will cost you money. 9. Set, Props, Wardrobe, Hair and Make-Up. The moment you decide you will need to design sets, use special props and wardrobe as well as get professional makeup artist and hair stylist involved, you are entering a whole new arena and this next level means more spending as well. There is one more component that people often don’t realise is a cost and that is – music. Music can be royalty free, but it can also be very expensive. It very much depends on the type of music you want to use in your corporate video. But be aware that the moment you want to use any popular music in your video, you have to think about a much larger budget. Popular music licences do cost a lot. Video production like any other serious production process involves planning. If you work tightly together with your production team and plan carefully, you can create good videos with a variety of budgets. Sometimes smaller budgets mean people have to think more creatively and it can in the end result in better, more interesting videos. If you want to discuss your video production idea with CineEye representative, contact us here. Yes, I agree with your words. Producing a video can be expensive. The important thing to remember is time, people, and production gear tend to drive production costs. Thank you, this is a great article. Well thought out and many of my questions answered.